Our site/blog is on wordpress.com. 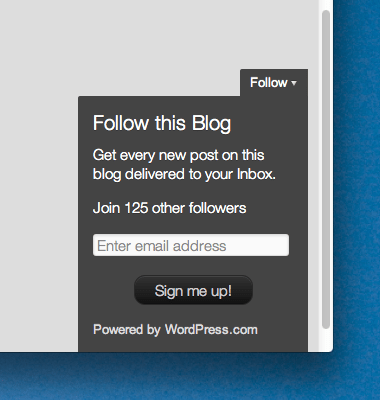 When you follow a blog on WordPress.com, you’ll receive notifications of new posts by email. If you have a WordPress.com account, when you are logged in, click the button that appears in the toolbar at the top of all WordPress.com sites. All new posts published on that blog will now show up in your reader. You will also receive email notifications of new posts. You can change your settings to Immediate, Daily, or Weekly delivery, or opt-out of email notifications. – Just fill in the form at the top of this page and submit, Be sure to click on the confirmation link in the email that we send you. Until you’ve confirmed your subscription request, you won’t receive email notifications for new posts and updates. Be sure to click on the confirmation link in the email that we send you. Until you’ve confirmed your subscription request, you won’t receive email notifications for new posts and updates. Already subscribed to the website, but I am not receiving emails of new posts published ! Some subscribers informed me that they are receiving more than one message for the same article published. This might be due to merging some blogs/sites into this site http://AbdurRahman.Org/. To mitigate the issue , please visit the below link and manage all your subscriptions. You can delete / unsubscribe duplicate subscriptions.